Ange, why do you have a picture of dame edna? Is it because she's the new face of Woman's Day in Oz and know one can work out why, considering, if you didn't know, that she's really a man? 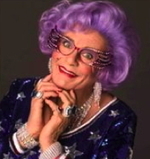 I have lots of pictures of Dame Edna, Wisey. They are slathered all over my room, under my mattress and behind the stall in the Adrants public toilet. If you're a real friend, you won't judge me. but judging is the best part of being friends!